What a difference 12 years makes. In the sizable gap between Doom games, the first-person shooter genre has evolved in myriad ways. Far Cry embraced the freedom of open worlds. Call of Duty set a new high bar for set-piece-driven linear campaigns and deep multiplayer progression. Games like BioShock doubled down on storytelling, while others like Team Fortress 2 abandoned single-player altogether in favor of dedicated competitive experiences. The further these offerings push boundaries, the less modern shooters resemble the game that put the genre on the map. 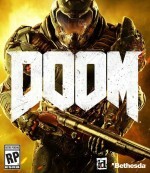 This diaspora ultimately works in favor of id Software’s latest Doom title, an unrelenting, kinetic, and obscenely bloody return to form for the first mainstream FPS. Even though this long-overdue reboot resurrects several traits that made the original two titles so revered, it feels surprisingly fresh. Forget hiding behind cover for prolonged bullet exchanges or following a linear path to your objective while killing endless waves of generic dudes with guns. The Doom campaign eschews these modern trends completely. To survive blood-drenched battles with a familiar array of classic Doom demons, players must embrace constant movement, make on-the-fly tactical shifts, and get up close and personal with enemies for brutal, over-the-top executions. This gameplay dynamic requires responsive controls, and id Software is up to the task. With no weapon reloads or sprint buttons to worry about (the fabled “Doomguy” protagonist moves in a constant state of hurry), you are free to focus on picking the right weapon for the occasion and artfully dodging of incoming projectiles and rushers. The level design is much more vertical than previous Doom games, allowing skilled players to vault to safety and platform across pillars to break line of sight. Clicking on the weapon wheel gives you a brief respite in the midst of battle, slowing down time for a moment, but once you memorize the weapon placement you can quickly tap and flick to access the classic Doom arsenal on the fly. The frenzied combat feels unlike any other shooter on the market, and creates memorable moments that honor the legacy of the franchise. Pulling off a chainsaw kill while near death to recover a treasure trove of health and ammo, laying waste to an onslaught of heavies thanks to a quad damage power-up, or stringing together a series of glory kills to cap a frantic arena battle are the real reasons to play this game. While the action faithfully adheres to the pace of classic Doom, id incorporates several minor, contemporary design touches help flesh out the campaign experience as well. By scouring each level between battles, players uncover power-ups that enhance health, ammo, and weaponry. Finding drones allows players to choose new weapon modifications that add powerful applications like a small missile barrage alt fire for the heavy assault rifle or a grenade attachment for the combat shotgun. The base weapons already pack a serious punch – I’ll never grow tired of turning demons into blood mist with the super shotgun – but the increased variety encourages experimentation. The most interesting collectibles are runes, which players earn by completing trial missions that briefly pull you out of the campaign. These feats of skill typically revolve around killing a certain amount of enemies with a particular weapon before a timer expires, and completing them unlocks new traits that you enable in one of three rune slots. My favorite runes focused on enhancing movement, allowing me to pull off glory kills quicker, move faster for a short time after performing a glory kill, and have more control in the air while double jumping. The campaign splits its time between the Mars space station and Hell itself, each of which provides excellently crafted combat arenas. Once id reveals the last classic demon, Doom settles into a comfortable (if predictable) pattern of simply throwing more difficult waves of enemies into the fray. The battles stay hectic, but Doom could have used a few more wild cards later in the game to keep the experience fresh. The game sprinkles a few boss fights into the mix as well. These offer a decent challenge on higher difficulties, but essentially serve as palate cleansers. A forgettable narrative about scientists harnessing the energy of hell pushes the action in a forward trajectory, but rightfully takes a backseat to the combat. The final pillar of Doom is an ambitious creation tool called SnapMap. This beginner-friendly toolset allows players to quickly design single-player, cooperative, and multiplayer challenges. The tutorials do a great job of coaching, but ultimately the pre-fab options at players’ disposal limit creative freedom. Instead of designing your own spaces from scratch, you are forced to use templates, and they dreadfully lack diversity of settings. I haven’t found many compelling experiences available to play thus far, which is to be expected considering the community is still playing around with the feature set. SnapMap may lead to some interesting gameplay experiments, but its limitations will likely turn off the serious modding scene. Driven largely by its successful single-player campaign, Doom is a welcome return to form for the genre-defining franchise. By sticking to time-worn traditions in all the right places and deftly employing some modern flourishes, id has rediscovered what made this demon slaying series so successful. Multiplayer and SnapMap don’t reach the same heights, but shooters fans shouldn’t miss this bloodthirsty romp through hell. Id Software’s latest is an unrelenting, kinetic, and obscenely bloody return to form for the first mainstream FPS.